or not he will ever win again. died on November 27th, 2009. 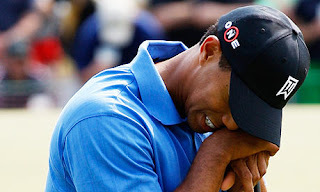 Tiger Woods is a loser. confident, or resistant to pressure. and the shame of being found out. He will never be the same. and having confidence in your shots. Tiger Woods will never win again. The all-new "Cry-baby Tiger" action figure... coming soon. a Superman is no longer invincible. He is human. He is flawed. ... and he will never be the same. He will never be #1 in the world again. This guy is barely making the top 10. ... you can quote me on that. Not that I fully disagree with your entire blog, I find it fasinating that you think one of the greatest skilled golfers can go from the top and never be relavant again. I don't watch golf, think it's boring and a stupid sport. That being said I just don't see how someone can have the skill to be tops in the world and maybe not fully reach back to where he was but just be relavant. What he did is unexcusable and down right moronic. Strictly speaking from a position of golf, he's one of the best golfers in history, there is no way he doesn't at least make another run at something, he was out of the sport for almost 2 years. You just don't become the worlds best golfer on sheer luck. So that being sad he must have some talent, if we can agree on that then you would have to believe that he will be good again in some capasity. America especially loves a come back story and giving people second chances, if michael vick can kill dogs and be forgiven and come back and play football, why not tiger? The skill is still there, Mr. Critique. ... but his brain cannot access it. just that he'll never be the guy he once was. of comforting, that's an awfully lonely place. This is an interesting and cloudy perspective. Mr. Critique is correct. Where do you get off saying that the best possibly ever at the age of 36 will never win again? Say he plays 10 years (once he is healthy)...there are 4 majors per year. That's 40 chances. This is a ridiculous notion. What are you, some kind of comedian? That whole "(once he is healthy)" is a big question mark. My perspective might seem cloudy, but the fact is he hasn't been the same since his fall from grace, and although he knows what winning feels like, it's not easy to have the confidence that it takes to get there again. I'm simply betting that he won't. Ever again.